In the Linked Earth context, a working group (WG) is a self-organized coalition of knowledgeable experts, whose activities are governed herewith. 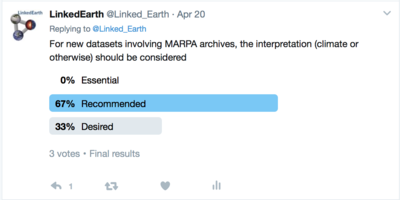 This page is dedicated to the discussion of data and metadata standards for MARPA (marine annually-resolved proxy archives, including corals, mollusks, and sclerosponges), and aims to formulate a set of recommendations for such a standard. Note that chronological aspects should be discussed within the Chronologies WG. This working group has 7 members. 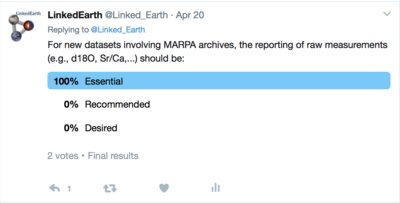 Below is a summarizing the metadata from the File:MARPA Template.xlsx. See the Discussion to comment on the template, fill out the table below, and vote on the polls. 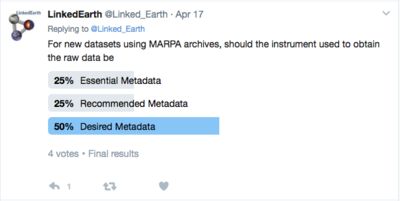 See this page for the definition of essential, recommended, and desired metadata for the standards developed by LinkedEarth. Note: Although the new release of the LinkedEarth ontology will include a PhysicalSample category, there are no formal ways to describe the samples beyond their name, the possibility to enter an IGSN number or a lab ID number, a Collection Method, and where the sample is currently located. 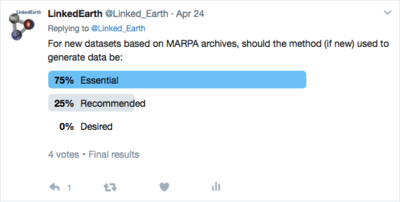 There were 5 votes since the poll was created on 15:34, 31 March 2017. In the LinkedEarth ontology, this refers to the Instrument. Instrument Type We created an ontology for the various types of instruments. It's set as the category for the page. Method Name of the method or paper published about it. In the LinkedEarth framework, the method is described at the variable rather than the instrument level. This allows for multiple methods used on the same instrument since the method is related to the measurements rather than the tools. Creator In LinkedEarth, the contributors of the datasets are acknowledged of the datasets and should include the authors on the publication as well as anyone who has contributed to producing the data (e.g. lab managers and technicians not included in the publication). contact info contact email for the person in charge of the data. Contact information on the LinkedEarth database are set on the user profiles. Each user can choose which information to share with other LinkedEarth member. Visitors to the site (i.e., person not logged in) do not have access to profiles' information. 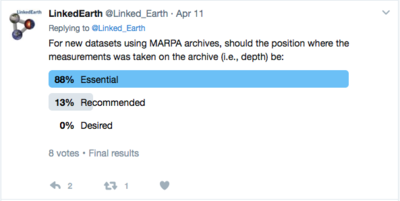 Results of the poll ran on Twitter between April 17th and 24th. There were 5 votes since the poll was created on 16:11, 31 March 2017. There were 5 votes since the poll was created on 16:13, 31 March 2017. 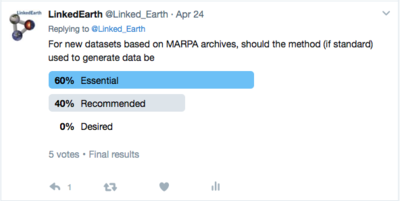 MARPA recommends to archive the methodology used to develop chronological information. Further discussion should be done in the chronology working group page. For more information about climate interpretation in LinkedEarth (and LiPD), see this page. There were 5 votes since the poll was created on 16:26, 31 March 2017. 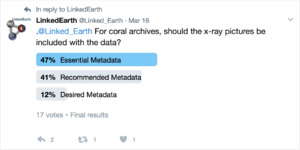 For coral archives, should the x-ray pictures be included with the data? There were 5 votes since the poll was created on 10:16, 14 March 2017.